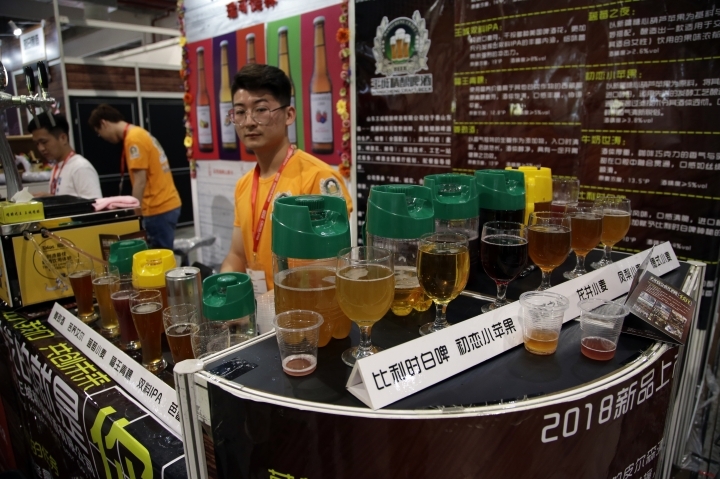 SHANGHAI — "Panda Beer," ''Little General," ''Flying Fist IPA," and "Mandarin Wheat" are among the offerings on tap at a craft beer exhibition this week in Shanghai dedicated to expanding the palette of Chinese consumers and promoting sales of high-end brews. The 2018 Craft Beer of China Exhibition features breweries like Rasenburg Beer, Myth Monkey Brewing, Lazy Taps, Goose Island and Boxing Cat Brewery that are sharing tips on the latest technology and sales trends as Chinese shift from legacy brews to more experimental, refined, and expensive flavors. From taps at the expo flowed creative mixes of flavors and traditions, a swirling cocktail of Chinese ingredients, barley, hops and spices from around the world. 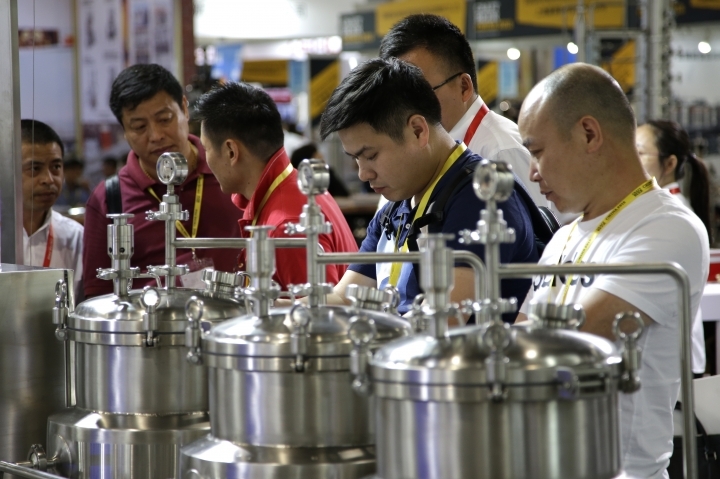 "After drinking it (craft beer), it feels much better than the domestic industry beer, and then you just can't leave it," said Yu Shiqi, a 40-year old craft beer consumer at the expo who dreams of brewing his own. There's money to be made in China, which drinks a quarter of all beer worldwide, and small-batch brewers and giant multinationals are cashing in. Though craft beer is far from upstaging local beer behemoths like Tsingtao that dominate the $28 billion national beer market, it is rising in popularity as small breweries open up in China's major metropolitan areas like Beijing, Shanghai and Shenzhen. Craft beers are typically more expensive than mass-market, low-alcohol content brews like Budweiser and China's Yanjing. But as China's middle class grows, so too does its tastes for finer products. A couple of years ago, craft beer made up only 0.3 percent of total beer consumption. 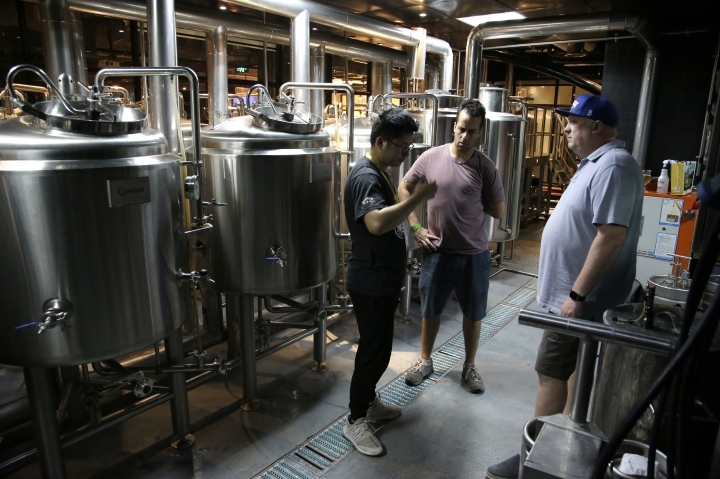 It has since risen to about 5 percent, said Darren Guo, one of the exhibition's organizers, who expect to see 30 percent growth in the craft beer market every year until 2020. "Beer culture is pretty much on the beginning or starting level." Laurel Liu, sales director of Beijing-based Jing-A brewery, says she gets calls from small towns asking how to start up a craft brewery. "You don't even expect them to have craft beer there but now they do," Liu said. "I'm really surprised and happy to see now that craft beer in China is a thing and it's really easier to access these products now." More money was spent on beer in China than the USA in 2017, according to beer industry research firm Drink Sector. Craft breweries were "rapidly increasing" although foreign imports continue to dominate the high-end beer sector. The Belgian-Brazilian firm Anheuser-Busch InBev, the makers of Budweiser, has invested heavily in China, building breweries and acquiring craft breweries like Shanghai's Boxing Cat. Anheuser Busch also owns Goose Island, which is based in Chicago. Michael Jordan, brew-master at Boxing Cat, and his staff experiment with flavors like egg tart, green tea, peppercorn, chai, kiwi, hibiscus and sweet potato. Jordan chalks up some of the success of craft brewing in China to President Xi Jinping sharing a pint of IPA, or Indian Pale Ale, in 2015 in the UK with then-prime minister David Cameron. "The 'Xi phenomenon' really kind of opened people's eyes to IPA," he said.